I had been keeping this too long in the draft mode that I forgot about this entry. Time to get it out for memory's sake ;) World, cherish your family! I had had a good weekend these couple of weeks. A good weekend means quality time I spent with both Suami Terchenta and our precious little baby. To me, no matter how crappy the week had felt like, I must put in efforts to make my little girl happy. Surprisingly it has been easy to put away any ill-feelings I harboured throughout the week and don my 'World's Fun-nest Mommy' mode. Just seeing the joy and happiness in my baby's eyes made me forget about work and instead concentrated to live in the moment watching my baby grow in front of my very own eyes. 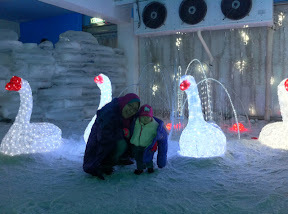 She was nevertheless fascinated with the lights and I was pretty sure she would grab those lit-up ice carvings if she could free her hands from the thick jackets. It was probably the highlight of her trip, much better than the freezing Snowalk or the lights walk we took later. This week, we didn't go anywhere but we brought her down to the swimming pool for some splashing fun. The last time she went into the pool was when she was 4 or 5 months old. I brought her toy duck and she loved chasing after the duck in the water. Today, we brought her for brunch at PappaRich nearby our house. 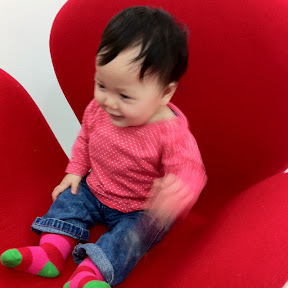 She enjoyed her bun and even shrieked along to Celine Dion belting out her evergreen songs. Khayla could be really boisterous too. In the evening I brought her to play at the playground. To summarise, she loves the swing and hates everything else. We also brought her to visit Che Mat's family and she loved Kak CT's boys, and vice versa. Truth is, I wished we could have a lot more weekends like what we had this week. C'est la vie people! Memang sejuk, keluar wap dari mulut sumer... Hehehe. Komen apa wak?